The first of the “bad handwriting” myths is the belief that children have untidy handwriting because they are lazy. I always say that if your child was able to write neatly they would. No child ever wakes up in the morning and decides that today will be the day they will start writing illegibly. For the most part children want to please their parents and teachers and they quickly catch on to the fact that tidy handwriting equals a happy teacher. 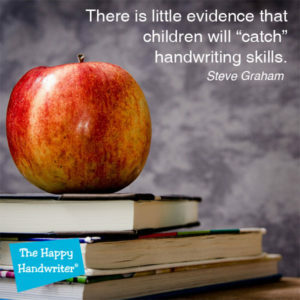 So, for the greatest part, if they aren’t writing neatly there is some underlying foundational building block that is missing or not working optimally and we need to take a look at handwriting intervention strategies. Children have untidy handwriting for many complex reasons. Handwriting has a host of foundations that feed into its successful mastery. It is like a wall with handwriting at the top and the foundations and bricks are all building blocks along the way to reach that goal of legible, automatic and speedy handwriting. I look at this in The Wall®, a guide for occupational therapy students. If I were to pick just two common reasons out of all of them as to why handwriting comes unstuck, it would be because children lack well-developed pencil control, and they have poor letter formation. Working on letter formation requires a sensory-motor approach including kinaesthetic, tactile and auditory input. The Build-a-Letter® Bundle is just the one for this as it incorporates all of these, including The Happy Handwriter’s Letter and Number formation songs which are a powerful tool in assisting with the establishment of correct letter formation. Our next myth is: “If you just practise lines and lines of handwriting, it will improve.” This doesn’t work. I know this from experience and if you have read this far in this article, you probably do too. Children need specific exercises for handwriting improvement including activities to strengthen fine motor skills for improving pencil control. 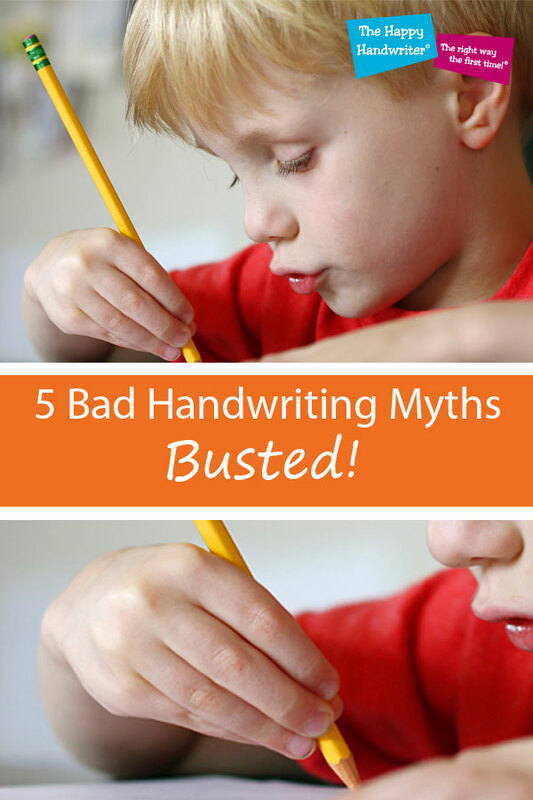 The third of the bad handwriting myths is the belief that because your child can write neatly if they focus on it, it means that they always can. Children with illegible handwriting can often achieve a legible script if they really concentrate on their handwriting and focus all their conscious attention on ensuring their letters are well formed and touch the lines. But this doesn’t mean they can always do it. Producing a piece of writing or performing maths calculations requires your child to use their working memory. Working memory resources are limited and there really isn’t enough to focus on both the “how” and “what” to write at the same time. So if handwriting is automatic and legible, your child can focus all available working memory resources on what they are writing. It really is an either or situation in the early stages of schooling. 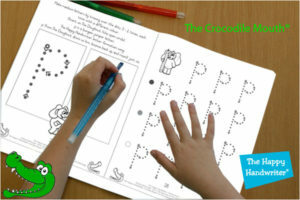 They can focus on the “how” of handwriting or on the “how” of maths calculations. You don’t want your child using up their working memory resources on the “how” of handwriting, leaving little left over to decide what to write. We want handwriting foundations to be established on an automatic level and this requires exercises to improve handwriting and specific handwriting intervention strategies. Our fourth myth is that “it doesn’t matter that my child has untidy handwriting – I hardly ever write anymore.” There is a giant chasm in the middle that frequently gets forgotten. There are many hours of schooling and examinations to get through before you arrive at the place where you “hardly ever write.” Children have to be able to write exams, and long ones. They need their handwriting as an automatic skill that they really don’t need to think about at all. So the fact that a parent hardly ever writes does not make it a given that their child needn’t master good handwriting. They need it until they reach the “hardly ever write” phase in their lives. “We live in the techno age so handwriting is redundant”, is the number 5 myth, which probably should have been the first! I am not going to go into this here – if this is an issue that you are concerned about, download my free eBook on Handwriting in the Techno Age: 5 Reasons it Should Stay and I trust you will be convinced by the time you are done! So laziness, repetitive practise, being able to write neatly when you focus directly on it, the “I hardly ever write anymore” and “it is the techno age we don’t need it,” are myths that we need to leave behind. We need to provide our children with solid handwriting foundations through the use of handwriting intervention strategies. Solid handwriting foundations are to academic performance what times tables are to maths – your journey to success is going to be significantly more difficult if you don’t have them at your fingertips.